Aerial photo of Oak Hill (from Terraserver, found by Betsy McDonough). The J-bar lift line is right in the center, with two or three trails fanning out from the top. Oak Hill was the site of one of the earliest overhead cable lifts in the country. In fact, it is possible that the J-bar was first built at Oak Hill (The Colorado Skier Newsletters). However, aside from that, this ski area was fairly usual for its size. It offered skiing on that J-bar on an approximately 350 foot drop. Several slopes and trails were available. Dartmouth College ran this area, mainly for training and for students to learn on. 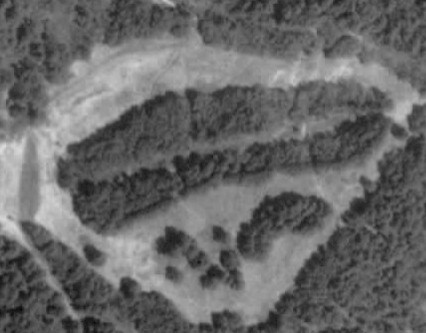 It closed during the 1980's, due to Dartmouth's much larger Skiway in Lyme..
"I can also offer some comment on another Dartouth-related ski area. 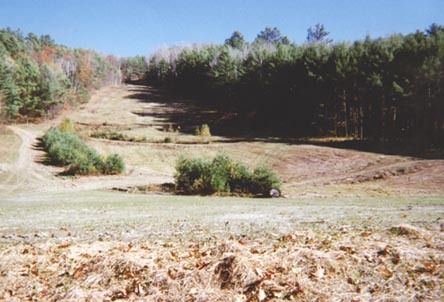 Your page about Oak Hill in Hanover, NH speculates that it was closed because Dartmouth owns the Dartmouth Skiway in Lyme, a much larger facility. This is indeed the case as the Skiway was constructed as a replacement for the downhill facilities at Oak Hill. 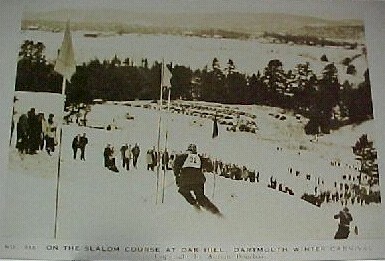 Oak Hill is currently used for cross country skiing in the winter under the name of the Silver Fox Touring Center (though mountain and general area is still referred to more frequently as Oak Hill). Additionally, one of the structures at the base of the ski area was constructed in the mid-1990's and is still used by the Dartmouth Outing Club and the Outdoor Programs office at the college for a variety of purposes." 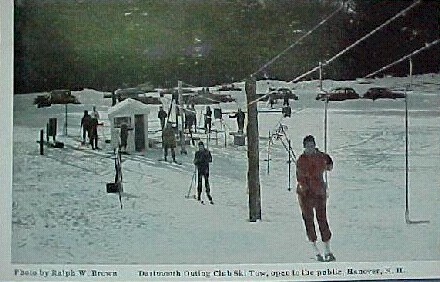 The Dartmouth Outing Club has installed an improved ski tow (Ski Tramway) 1200 feet in length with a capacity of 600 skiers per hour on Oak Hill to serve a series of large open slopes and connecting touring trails. Wide variety of grades, and of terrain, with sections for all classes of skiers. 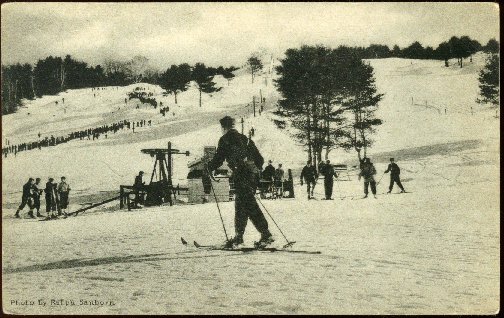 The ski area as it appeared in the late 1930's. Look ath the amount of people on slopes, likely for a race. This is one of the few shots of the first J-bar in the country! The ski area was a lot more open during the 1930's then the 1970's. Check out this shot as it appeared in 1998, below. Another rare shot of the J-bar, but much later, given the cars in the parking lot. 1950's? Notice how the towers were wooden! Racers at Oak Hill. Date unknown. Oak Hill had a J-bar lift, 4 tows, slopes, 4 trails, jumps, novice and intermediate, skating, ski school, and patrol. Same as 1964, but the vertical is listed as 400 feet. The lift has been removed but the trails are kept up well. The base shack for the lift is still standing as is a "base lodge." 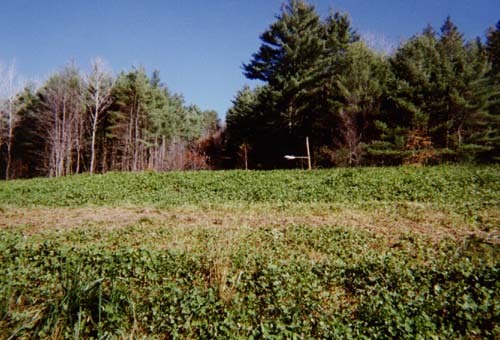 There are several hiking trails in the vicinity.